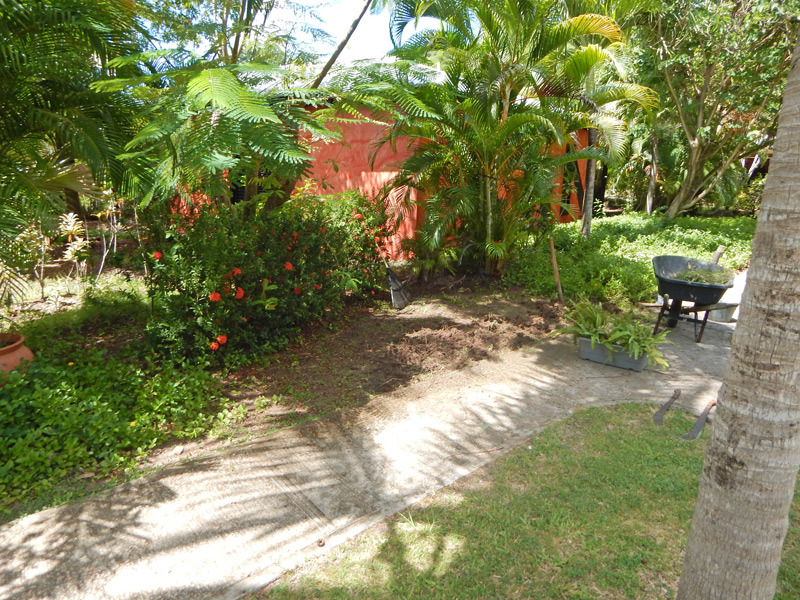 I’ve been doing some landscaping work for a client, working on cutting down the labor to maintain the landscaping while helping make the transition to organic from chemical maintenance. On Tuesday I was finding weedy, empty patches where the landscaping wasn’t filled in and finding solutions using plants already available on site. I initially thought I’d try to coax the Singapore daisy into the area, but I don’t think they like that much shade and the very, very hard, dry ground, so I decided to go with something else that makes a dense mat of growth. I came across a little patch of ferns in a dense clump, growing between two buildings in hard ground, covered by tree canopy. No sun? Hard ground? Dry? Yep, they were doing well, so there was my answer. 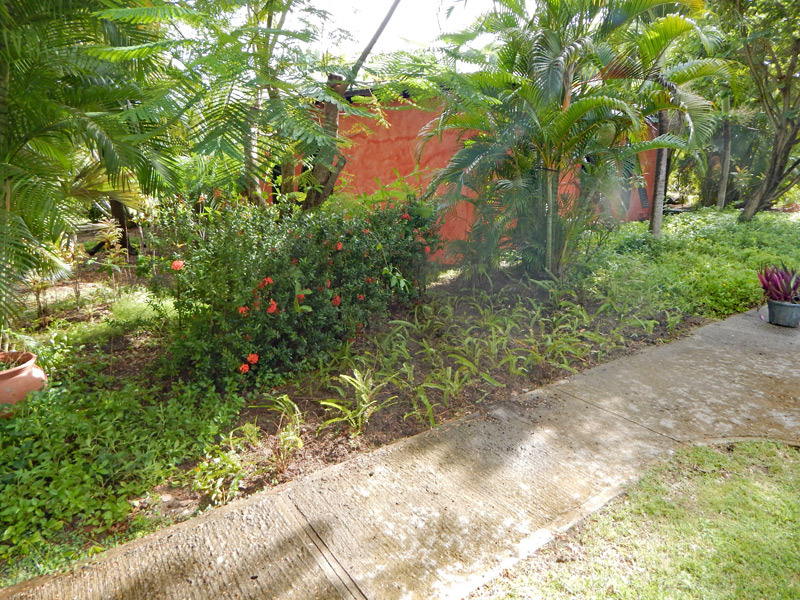 I took my machete and started dividing off ferns while another man hacked up and loosened the soil between the Singapore daisy beds. I came back with bundles of ferns, helped him finish loosening the ground, then we planted the spot. 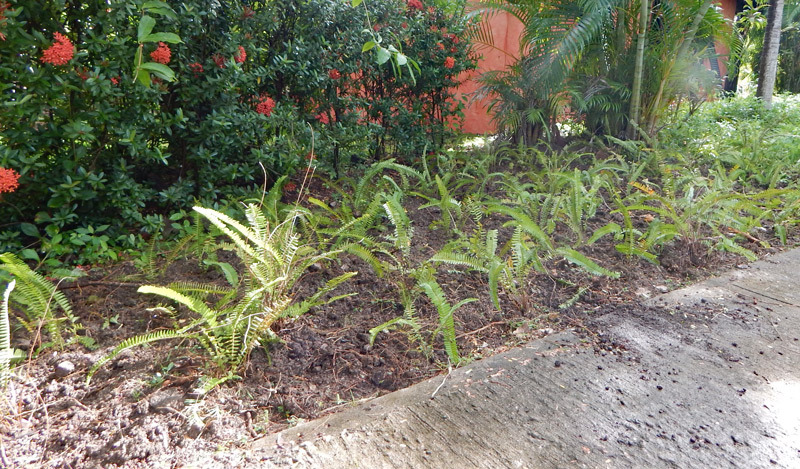 Next thing to do is feed and mulch the area so the ferns will get a head start on any weeds that want to invade. I never thought I’d be doing ornamental landscaping but I have to admit I’m enjoying it. Over time, I’ll be adding edibles and fruit trees to the landscaping. For now, I’m just cutting down on bare patches and high maintenance areas. I made this area look better without spending a dime. Once it fills in, it will really look good. Yes – you’re totally right. Don’t apologize. It’s funny.